Cruise Talk: The QE2 in Dubai as a Hotel Ship CruisePage.com - Discount Cruises, Last Minute Cruises, Cruise, Cruise Line, Cruise Vacation. With the QE2 saved, does anyone feel that she might follow in the footsteps of the SS Rotterdam or the MS Veronica, (which was briefly a hotel ship before going to Alang). After nearly ten years of an uncertain future that included rumors of imminent scrapping, the former flagship of Cunard's fleet, Queen Elizabeth 2 returns to service this month as a hotel ship in Port Rashid, Dubai. The former ocean line first arrived in Dubai in November 2008 and changed ownership numerous times as plans to return her to some form of service came and went. Over the past year however, her latest owners - the Dubai government entity Port, Customs and Free Zone Corporation (PCFC) - reportedly spent millions of dollars refurbishing and reconditioning the ship in preparation of a return as a hotel, museum and visitor center. Her lifeboats and davits were removed as part of the conversion to a hotel but other than that, her exterior looks much like it did when she was retired from her Cunard service. According to the hotel's website (www.qe2.com), the ship "...has been lovingly restored to her former glory - revitalized with all the latest in smart technology. Step aboard and relax in her comfortable rooms and suites that offer an imposing backdrop of Dubai's iconic skyline or the ocean beyond. Embark on a culinary journey across her 13 restaurants, bars and entertainment venues. Immerse yourself in her rich past at the onsite QE2 Exhibition." 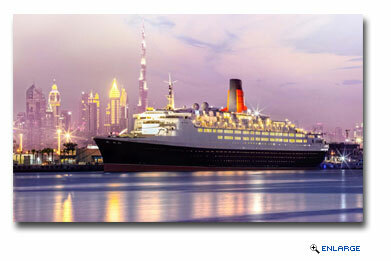 The Queen Elizabeth 2 Hotel is now accepting reservations beginning April 18th for 650 AED per night, which converts to $176 USD. There are currently 224 refurbished rooms and suites and 13 restaurants open for guests' use. A spa and pool deck will be added shortly according to the The Queen Elizabeth 2 Hotel website. This is one of the most cheering bits of news that I have read in a long time. Well done to all who've made this happen, and I wish them every success in the venture.